Strand DMX Splitter & Booster (EN) | PRO MUSIC, s.r.o. Philips RDM-6 Wall DMX Splitter & Booster is a 6-output DMX/RDM splitter with DMX/RDM pass-through supporting bi-directional communications for discovery, addressing and DMX control of Philips Vaya products. 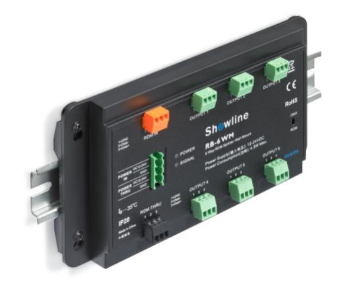 This unit takes the incoming DMX/RDM signal and splits the signal into six separate output channelsallowing for expanding the number of devices controlled from 32 to 6 X 32. The output terminals are electronically isolated from the input & RDM-through port and share a common ground reference. All six output ports have an independent output driver to boost the DMX/RDM signal.